The third run of our newly expanded 4-day Security Onion class will be in Houston TX! If you register before March 6, you can use the following discount code for $500 off! 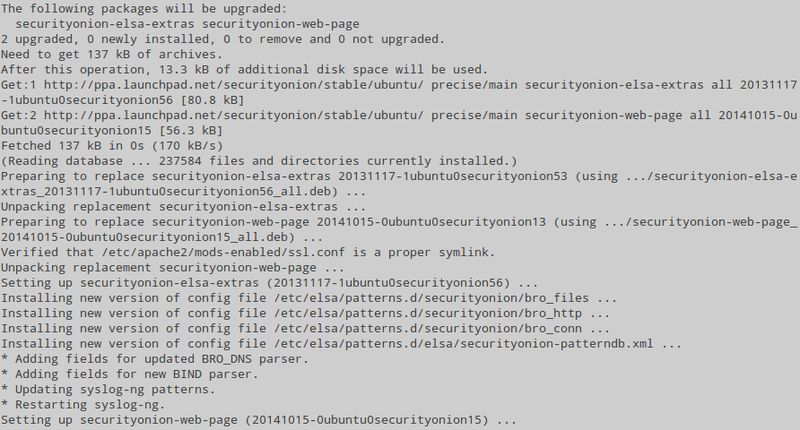 We have a new Security Onion 12.04.5.1 ISO image now available that contains all the latest Ubuntu and Security Onion updates as of February 5, 2015! Last year's Security Onion Conference was an overwhelming success! UPDATE 2015-07-10: Registration is now open! The first two sessions of Security Onion 101 sold out quickly, so we're going to run another session of the same class on Monday, March 2. I've updated our securityonion-et-rules package in preparation for our upcoming 12.04.5.1 ISO image. This is a static set of free NIDS rules from Emerging Threats that is only used if you have LOCAL_NIDS_RULE_TUNING=yes in /etc/nsm/securityonion.conf (most users should have LOCAL_NIDS_RULE_TUNING=no which causes PulledPork to download updated rules from the Internet). These packages have been tested by David Zawdie and Kevin Branch (thanks!). These new packages have been tested by Pietro Delsante and David Zawdie (thanks!). The second run of our newly expanded 4-day Security Onion class will be in Seattle WA! If you register before February 20, you can use the following discount code for $500 off!